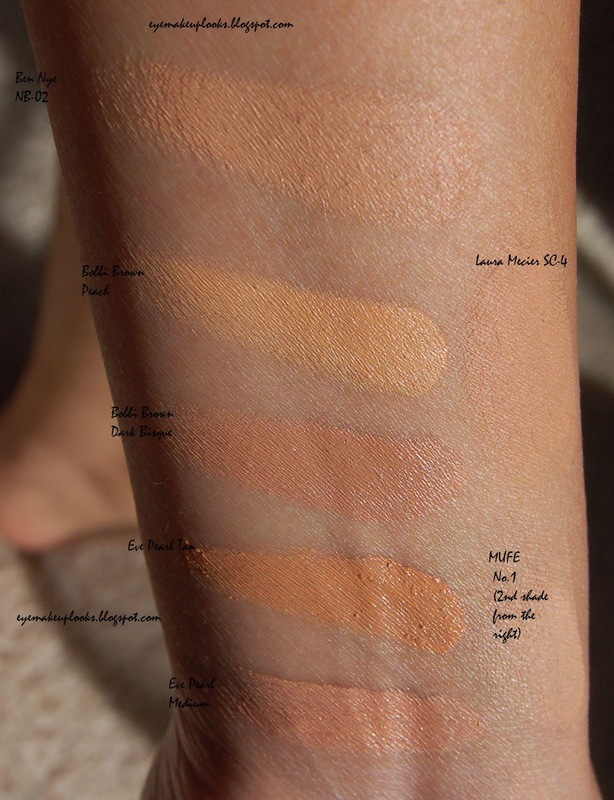 I have been meaning to show pictures and swatches of my favorite correctors for a while. So here it goes. I have tried really hard to take good closeups, so please click on each image to see the true colors. 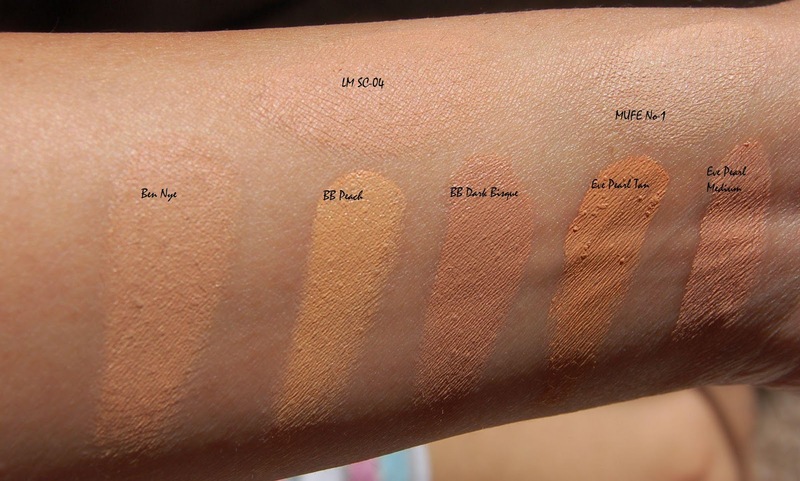 Under eyes: Bobbi Brown Dark Bisque (when I am NC42-44ish) and MUFE No-1 (2nd shade from right). Around my mouth: I am much darker around my mouth area. I would say around NC45-47. Eve Pearl in Tan is PERFECT!!! Thank you so much. My skin tone is similar to yours and I have been dying to find the right correctors. I always look up your blog for recommendations on foundations, concealers..
Do you apply corrector to the mouth area too? Can you do a step by step tutorial on how you apply the corrector and concealer (eye and mouth area)? @nisha sure I will try to do a picture based tutorial soon. Thanks so much for doing this! I'm looking for a good corrector for my undereye circles (thanks mom!). You said before you liked Eve Pearls in another post..are you still using hers? I'm an NC-35/37 but my circles are the bane of my existence!! Is Eve Pearls more heavy duty than Bobbie Brown? Thanks!! @Maya I use Eve Pearl in Tan around my mouth and in Medium under my eyes. IMHO I think they are more heavy duty than Bobbi Brown. Thanks for the reply to my comments..I'll look into the eve pearl..if only it wasn't so expensive!! @Maya It sure it, but Eve Pearl sometimes has good sales. Keep an eye out. I myself waited for over 6 months to buy the product 30% off.